The AP Stylebook today is making some changes in how we describe people living in a country illegally. 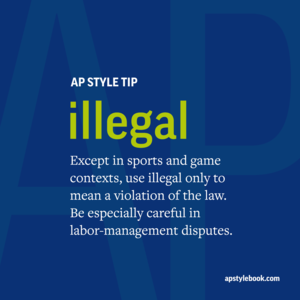 The Stylebook no longer sanctions the term 「illegal immigrant」 or the use of 「illegal」 to describe a person. Instead, it tells users that 「illegal」 should describe only an action, such as living in or immigrating to a country illegally. Those discussions continued even after AP affirmed 「illegal immigrant」 as the best use, for two reasons. A number of people felt that 「illegal immigrant」 was the best choice at the time. They also believed the always-evolving English language might soon yield a different choice and we should stay in the conversation. Also, we had in other areas been ridding the Stylebook of labels. The new section on mental health issues argues for using credibly sourced diagnoses instead of labels. Saying someone was 「diagnosed with schizophrenia」 instead of schizophrenic, for example. And that discussion about labeling people, instead of behavior, led us back to 「illegal immigrant」 again. We concluded that to be consistent, we needed to change our guidance. Is this the best way to describe someone in a country without permission? We believe that it is for now. We also believe more evolution is likely down the road. Will the new guidance make it harder for writers? Perhaps just a bit at first. But while labels may be more facile, they are not accurate. I suspect now we will hear from some language lovers who will find other labels in the AP Stylebook. We welcome that engagement. Get in touch at stylebook@ap.org or, if you are an AP Stylebook Online subscriber, through the 「Ask the Editor」 page. Change is a part of AP Style because the English language is constantly evolving, enriched by new words, phrases and uses. Our goal always is to use the most precise and accurate words so that the meaning is clear to any reader anywhere. illegal immigration Entering or residing in a country in violation of civil or criminal law. Except in direct quotes essential to the story, use illegal only to refer to an action, not a person: illegal immigration, but not illegal immigrant. Acceptable variations include living in or entering a country illegally or without legal permission. Except in direct quotations, do not use the terms illegal alien, an illegal, illegals or undocumented. Do not describe people as violating immigration laws without attribution. Specify wherever possible how someone entered the country illegally and from where. Crossed the border? Overstayed a visa? What nationality? People who were brought into the country as children should not be described as having immigrated illegally. For people granted a temporary right to remain in the U.S. under the Deferred Action for Childhood Arrivals program, use temporary resident status, with details on the program lower in the story.